The Nederlander Organizationannounced that Benny Andersson and Bjorn Ulvaeus' MAMMA MIA!, the smash hit musical based on the songs of ABBA, will return to Los Angeles at the Hollywood Pantages Theatre on January 26, 2016 for a limited one-week engagement through January 31, 2016. MAMMA MIA! features Erin Fish as "Donna," Kyra Belle Johnson as "Sophie," Laura Michelle Hughes as "Tanya," Sarah Smith as "Rosie," Ryan M. Hunt as "Bill," Chad W. Fornwalt as "Sam," Andrew Tebo as "Harry," Stephen Eckelmann as "Sky," Christina D. Eskridge as "Lisa," Max Ehrlich as "Eddie," Kat Borrelli as "Ali," and Justin Goei as "Pepper." MAMMA MIA! will also feature Niki Badua, Kyle Brunngraber, Cashelle Butler, Matthew Helfer, Juan Guillen, Joshua Taylor Hamilton, Stephanie Inglese, Lily Dickinson, Marcus John, Michael Lindsey, Danny Lopez, Todd MacIntyre, Rebecca Mason-Wygal, Paige McNamara, Austin Michael, Yael Reich, Dustin Harris Smith, Julia Cassandra Smith and Chris Villain. MAMMA MIA! is produced by Work Light Productions, whose other touring productions include Rent 20th Anniversary Tour, Irving Berlin's White Christmas, Vocalosity, and Crazy For You. The original production of MAMMA MIA! was produced by Judy Craymer, Richard East and Bjorn Ulvaeus for Littlestar in association with Universal, the creative team responsible for bringing MAMMA MIA! to theatrical life includes some of the most gifted and celebrated talents of musical theatre and opera. 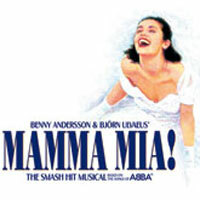 With music and lyrics by Benny Andersson and Bjorn Ulvaeus, MAMMA MIA! is written by Catherine Johnson and directed by Phyllida Lloyd. MAMMA MIA! has choreography by Anthony Van Laast, production design by Mark Thompson, lighting design by Howard Harrison, sound design by Andrew Bruce and Bobby Aitken, and musical supervision, additional material and arrangements by Martin Koch. The performance schedule for MAMMA MIA! is Tuesday through Friday at 8pm, Saturday at 2pm & 8pm, and Sunday at 1pm & 6:30pm. Opening Night is Tuesday, January 26, 2016 at 8pm.